The lucky people of South Thanet are going to have a longer ballot paper than most to contend with this May, with names belonging to more recognisable faces. Al Murray, as his Pub Landlord character, will run in South Thanet under the banner of the FUKP (Free United Kingdom Party). 1p a pint, a demilitarized zone between North and South Thanet, and political exile to Norwich for Alex Salmond are just some of the things we could look forward to under a Pub Landlord premiership. Watching his party political broadcast complete with pint, jingoism, and a stream of ‘common sense’ policies, it’s easy to see why Murray saw his character as an opportunity to mock Farage. 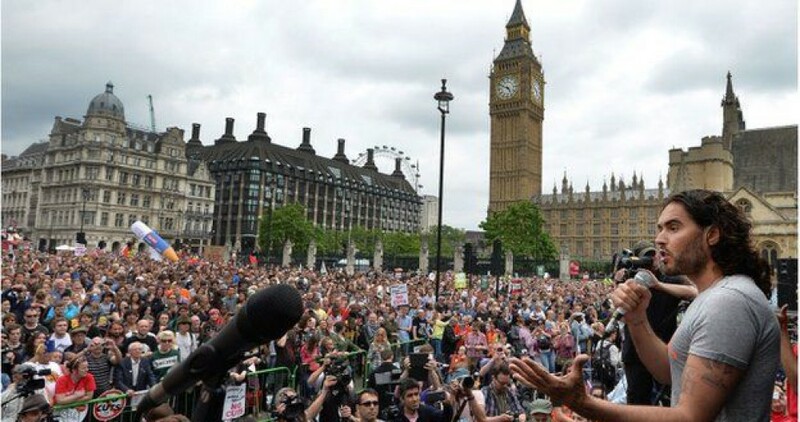 When I saw that the Pub Landlord was throwing his beer-soaked hat into the ring, I expected to see some criticism. As expected, some people are uncomfortable with such a blatant example of how inseparable politics and entertainment have become, seeing a comedy character running for office as making a mockery of the election. Whilst current polls disagree over Farage’s chances of claiming the seat, I also understand concerns that the Landlord will further split the anti-UKIP vote, the satirist increasing the chances of the satirised. Criticism from UKIP supporters was also surely inevitable. But what I didn’t expect were the comments on YouTube and Twitter from ‘Kippers’ criticising Al Murray for pretending to be something he’s not: for not really being a ‘man of the people’. Murray was drawn into Twitter arguments with Kippers who had gone on his Wikipedia page and decided he was too posh to pub. The charge against Murray is that he is part of the establishment. Descended from aristocracy, distantly related to David Cameron (maybe), privately educated, Oxbridge graduated. Murray disputed the role of his family in his success as a comedian (his great-great-great-Grandfather did not, allegedly, get him gigs at Jongleurs), and also pointed out that the Pub Landlord is a character, and that characters are generally not the same as those who portray them. The response to this was usually that it didn’t matter; a posh boy shouldn’t be pretending to be working class. Just got off the Ouija Board, gt gt gt grandfather Thackeray says carry on. The astonishment that someone playing a fictional character isn't like the fictional character usually passes in late childhood. By the way, my butler Jeremy does my tweets. This chimes with other recent debates about the dominance of Oxbridge graduates and posh people in the arts. Chris Bryant MP learned that James Blunt always has the last word when he used the examples of Blunt and Eddie Redmayne to argue that culture is dominated by the privileged and wealthy. (Sam Smith would’ve been the better example – James Blunt is so noughties). But whether or not you think Al Murray is representative of an Oxbridge elite squeezing out working class voices from entertainment, it’s fascinating to see Murray being criticised for not being a man of the people by people who put their trust in Nigel Farage. According to Margaret Hodge MP, Labour are losing votes to UKIP because Farage seems ‘more authentic’. Whilst it’s true that Farage didn’t go to Eton or Oxbridge, his ability to dodge criticism based on his background compared to David Cameron is interesting. He, like Al Murray, was privately educated. He didn’t go to University, but his career as a city trader is hardly an average post-school career option. In his most recent appearance on Question Time, Farage used his ‘20 years in business’ to portray himself as more in touch as other politicians. Whilst Russell Brand was far from top form that cringeful night, he was right to point out that Farage is no ordinary businessman. The strangest Twiticism of Murray I saw was an accusation that he’s mates with David Cameron, and that he’s going to use that fictional friendship to avoid tax. 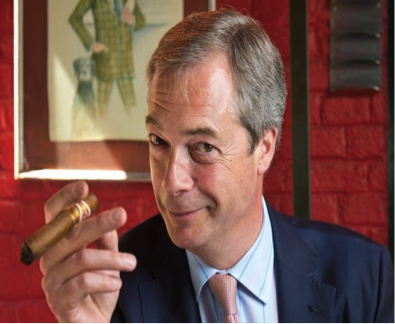 Guess who has actually used a tax avoidance scheme: Nigel Farage. Farage may be more upfront about his privileged past than the Pub Landlord (since, as a fictional character, the latter doesn’t have much to say), but as the leader of an increasingly influential party it’s troubling that the link between his past and his policies goes relatively unscrutinised. Do those hassling Murray whilst sticking up for Farage know or care about his plans to cut taxes for the wealthiest, or his continued links to the financial industry? How is it that Farage’s recent comments about being the ‘poorest man in politics’ weren’t laughed out of town, whilst David Cameron is ridiculed for attempts to make himself look more ‘ordinary’?. It’s possible that being the leader of a right-wing party helps; perhaps Farage’s eccentricities are expected and accepted. It may also be because it’s easier to present yourself as a man of the people when you’re on the outside shouting in. Perhaps anti-politics rhetoric and perceived authenticity go hand in hand; Nick Clegg was able to present himself as far more ‘ordinary’ than David Cameron in 2010 despite being another elite public school old boy. Authenticity is a tricky thing, constantly used as a criteria for judging people but rarely defined. Academics such as Alice Marwick have argued that authenticity is more about being seen to be consistent across all aspects of your life and communications than being ‘in touch’. 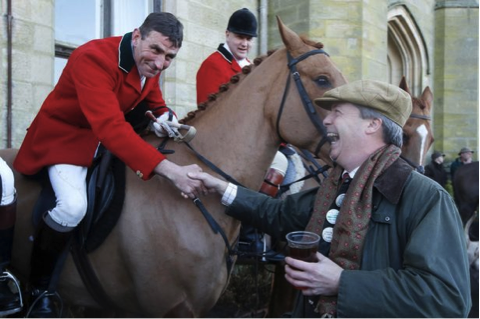 Maybe this is where Farage scores points in comparison to David Cameron; I’d argue that he is more open about his privileged background, even if his supporters seem to accept it in him and ridicule it in others. Both Al Murray and Nigel Farage are playing characters, but there are two key differences between them: Al Murray tells us he’s playing a character, and Nigel Farage is the one who may actually take a seat in parliament later this year. Alice Marwick’s 2014 book Status Update is a fascinating ethnography of the tech industry. This entry was posted in Celebrity Politics, Election2015 by ellenwatts11. Bookmark the permalink.